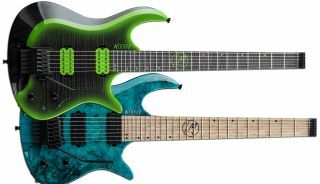 The latest Kiesel signatures for Born of Osiris' Lee McKinney combine the single-cutaway Zeus Series and the double-cutaway Osiris Series. Kiesel Guitars has teamed up with Born of Osiris guitarist Lee McKinney to introduce the new LM6X & LM7X headless guitars. These guitars combine the aesthetic of the single-cutaway Zeus Series and the double-cutaway Osiris Series in one complete instrument. Both guitars are offered with a limited number of Custom Shop options, but a chambered swamp ash body with a maple neck, 4A flamed maple top, stainless steel jumbo frets and a Kiesel-designed Hipshot tremolo all come standard. The LM headless series also comes equipped with a Lee McKinney Illusionist bridge pickup, a Kiesel Lithium neck pickup and acoustic bridge saddles. Electronics consist of a volume control for the humbuckers, a volume control for the acoustic saddles — with a mini-toggle switch for selecting humbuckers, acoustic or both — and a 5-way blade selector for selecting different humbucker coils. The Kiesel LM6X and LM7X guitars are available now, for the respective list prices of $2,999 and $3,099. For more info on the guitars, head on over to kieselguitars.com.